Ranged ground to air unit, unable to move and attack in the same turn. Critical hit at min range. Ballistas are vehicle anti-air ground units which cannot capture buildings. They're available to recruit from a Barracks for 800 gold. Although they cannot capture structures, they are effective against all air unit types. They'll perform a critical hit when attacking units which are at minimum range (exactly 2 tiles away). Ballista Cherrystone Kingdom Each Ballista is manned and maintained by a skilled Bowman. 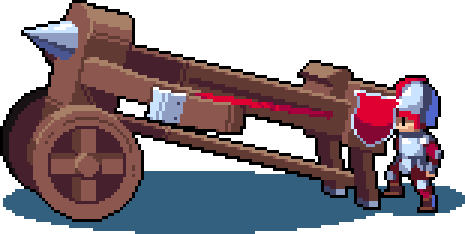 The Bowman will grow to appreciate the eccentricities of his or her particular Ballista, compensating for its shortcomings and leaning into its strengths. Should the machine be damaged in battle, the Bowman will carefully relearn the idiosyncrasies of his newly mended charge. Ballista Felheim Legion Felheim soldiers take a quantity over quality approach to the operation of Ballistas, learning to reload and fire them with blinding speed and miserable inaccuracy (this actually works better than you'd think). Felheim's Ballistas shoot dread bolts. These are exactly the same as normal bolts, but with the word 'dread' attached. Ballista Heavensong Empire With a complex system of internal pulleys and ropes, Heavensong's Ballistas are able to loose a bolt that can attain frightening flight speed, providing it with incredible accuracy and power. The front wheels are made of tungsten, delivering enough weight to keep the Ballista grounded despite enormous recoil. Ballista Floran Tribes The Floran Ballista is a crude device, constructed from wood, bone and springy vines. Despite this, the Florans' honed hunting instincts and keen eyes render it a powerful addition to their arsenal. It fires a vicious bolt made entirely of jagged bone. The bolt is razor-sharp, light-weight and durable, able to cover dramatic distances and pierce the strongest armour. This page was last modified on 22 February 2019, at 22:24.